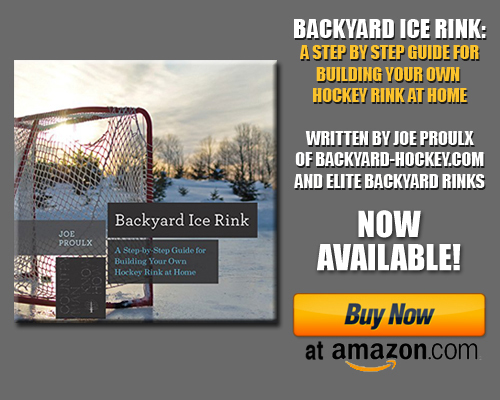 The Coolest Hockey Bedroom EVER is a series of posts chronicling the transformation from a boring bedroom to a hockey heaven for my son. You can read about his dresser here, his locker here, his headboard here, his hockey stick hooks here, and his broken stick corner shelf here. Have an idea for the room? Comment below. 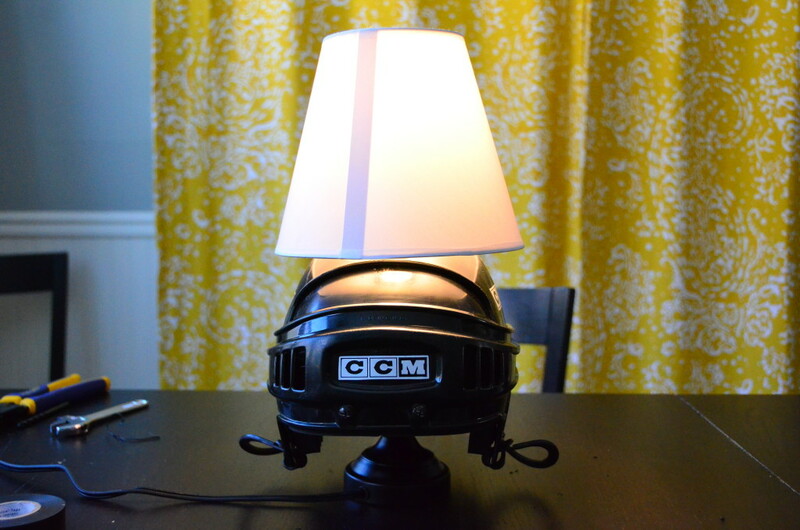 Hockey lamps are a little hard to come by. If you’re lucky you can find one online (like this generic one, or this one, or this interesting contraption), but they’re expensive and there’s not a lot to choose from. So in true cheapskate fashion, when it came time to add some more lighting to my son’s hockey-themed room, I built one myself for under $12. Like many of my how-to posts, there is no single way to do this. The info below is how I did it, but feel free to let your own creativity run wild and tweak this DIY to suit your skillset, your available parts, and your imagination. Also, before we begin, a quick warning. This DIY will deal a bit with electricity and may involve things like splicing wires, fiddling with light sockets, or replacing plugs. If you’re not comfortable with that, please don’t attempt this project. Also, we’re talking about building a lamp out of a plastic helmet. Make sure the bulbs you use don’t generate too much heat (so use compact fluorescent or LEDs), and always test the lamp for several hours before putting it in your kid’s room. Before you begin, think about how you’ll want to put this lamp together. Amazon (and many hobby shops) sell lamp kits, and those should work well. 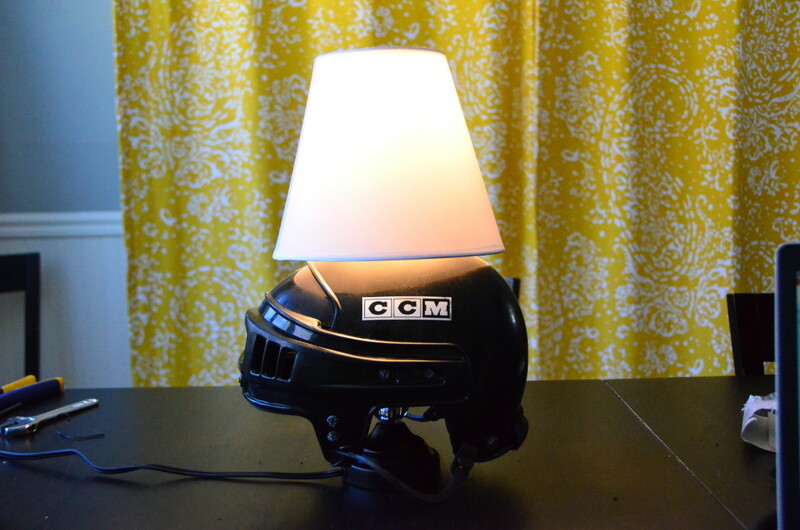 Because I tend to wake up in the morning and say “I’m going to build a helmet lamp today”, I didn’t have the luxury of online ordering, so I grabbed an inexpensive lamp from my local department store. Here’s the cheapo lamp I purchased for $5. As for the helmet, I have quite a collection that we use when people come skate on our rink. That said, a handful of them are very old and not entirely safe to use, so I grabbed one of these for my project. 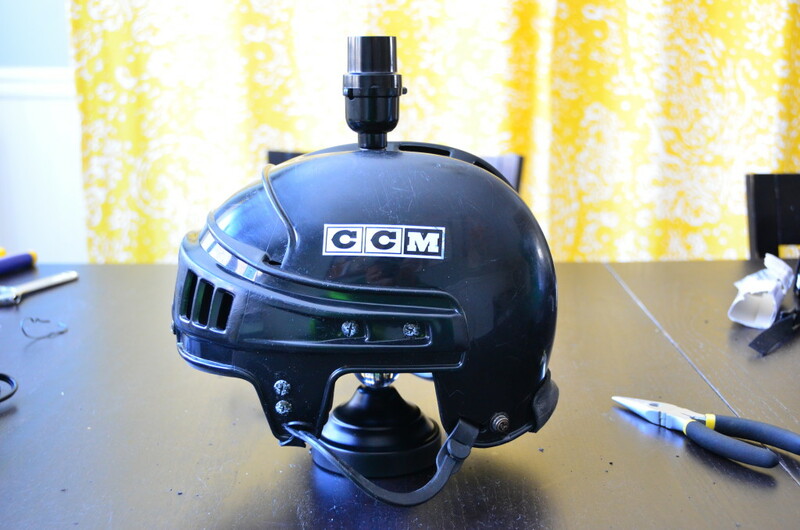 Skate sales or craigslist is a good place to try if you don’t currently have an old helmet. Note that you will destroy this helmet as part of this project, and it will not be usable for protecting one’s melon when you’re done. 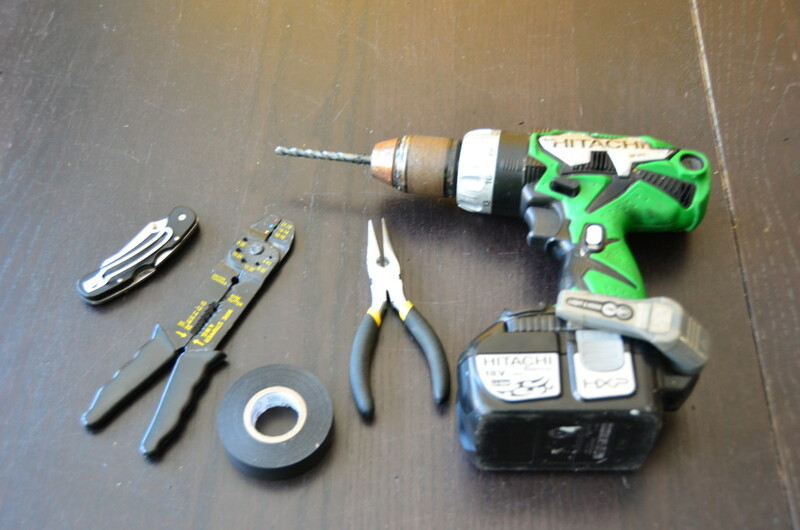 As for tools, you’ll want some electrical tools like a wire cutter and wire stripper, some electrical tape, a screwdriver of some sort and then a drill with drill bits. Some of the tools you’ll need. If you purchased a lamp kit, this step likely involves opening a box and laying the components on your work surface. 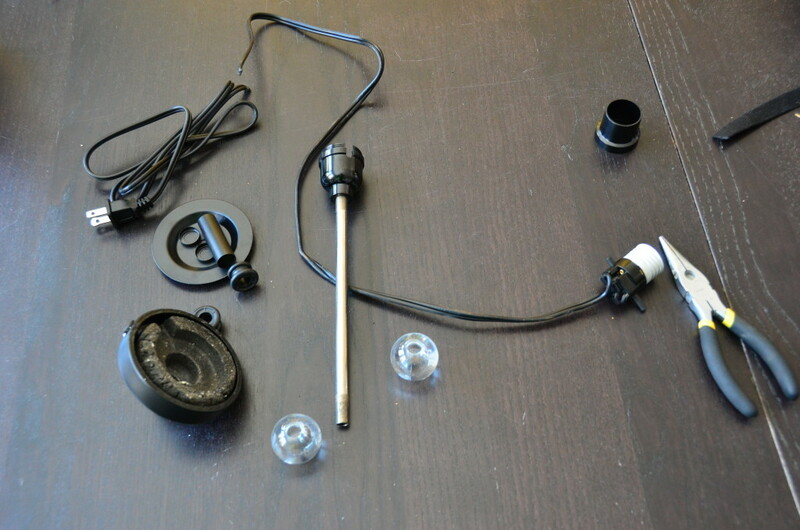 Lamp kits typically include the light socket, some wiring, a way to attach a shade, and some other components. But for me, this step involved disassembling the cheap table lamp I purchased. These inexpensive lamps are typically assembled not unlike a child would put together a macaroni necklace, with the cord being strung through the middle of each component. My lamp had a single nut under the base, and when that nut was unthreaded, all the components came apart. Here’s the nut that holds the entire lamp together. I removed mine with needle-nose pliers. And yes, apparently WalMart uses some sort of concrete as the base in their lamps. Who knew? 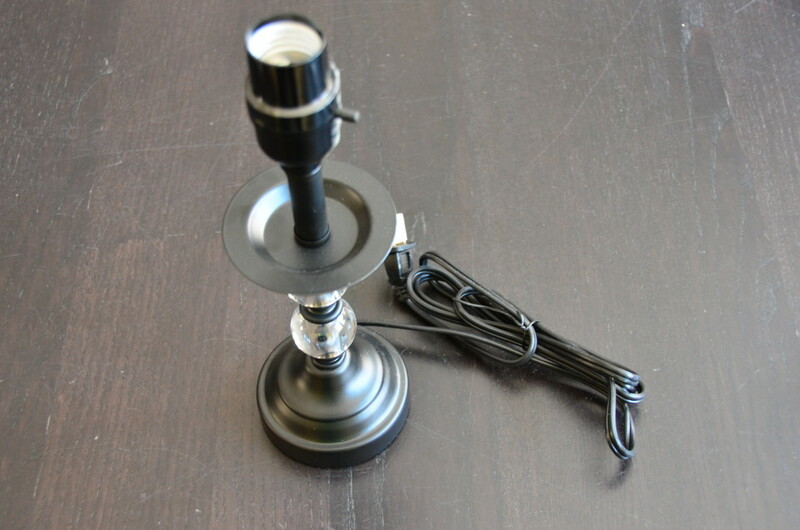 The challenge in using the ‘deconstruct an existing lamp’ approach is that your power cord is terminated on both ends – one end has the plug and the other end has the light socket. 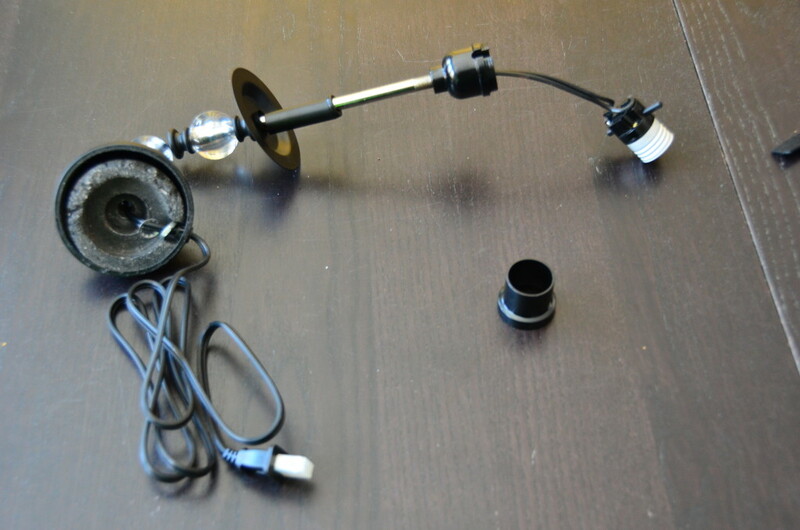 To take apart a lamp like this, you need to make a decision as to how you’ll want to put everything back together. 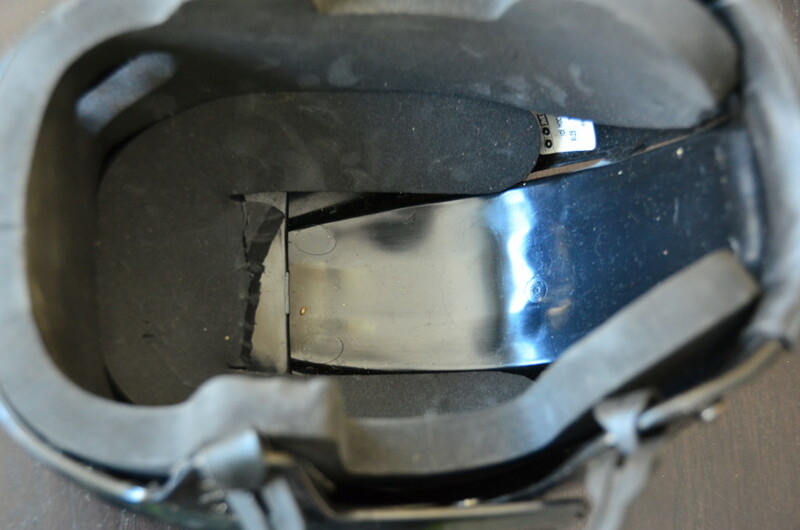 This shows the lamp when the nut was removed, but you can see how you can’t remove all the components due to the socket on one end and the plug on the other. 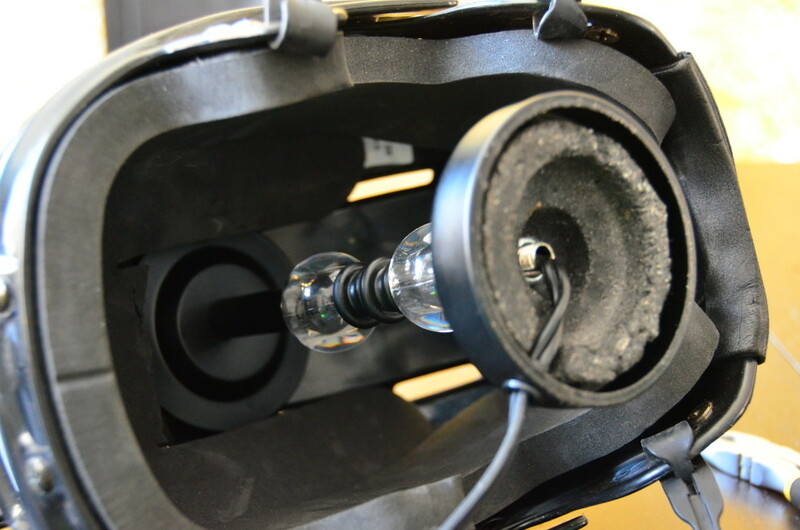 1 – If your lamp socket (the part where you screw in the bulb) allows you to remove the wiring with screws, then you can unscrew the wiring and pull the wiring through the components. Most cheap lamps (like the one I bought) have soldered wire connections and so this wasn’t an option for me. 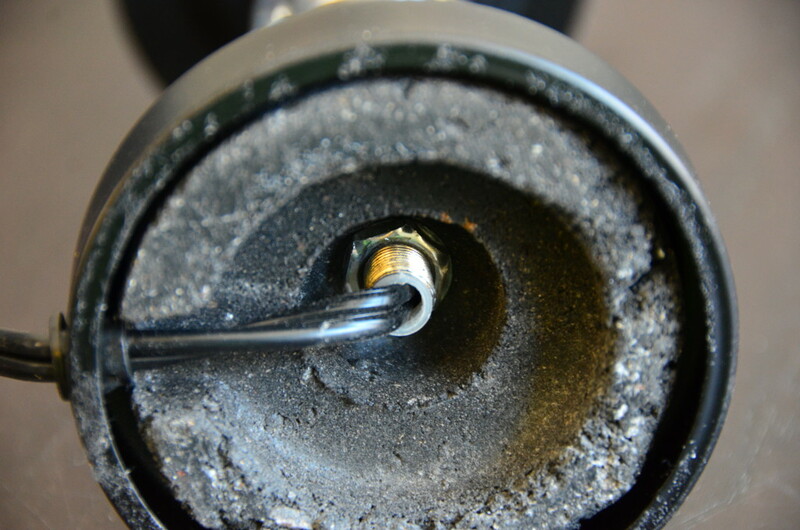 2 – If you want a cleaner finished look, you can cut the wire closest to the plug and when you’re re-assembling the lamp, you can use one of these replacement plugs, like this one. Just make sure (a) that it is the correct size and type for your lamp and (b) that you follow the manufacturer’s instructions when installing it. 3 – If you’re like me (entirely unprepared for the job and just trying to get it done before the kids get home from school), you can simply cut the wires somewhere in the middle and then re-attach them with a wire stripper and electrical tape as shown in this Youtube video. The first two options are preferable, but this one works too, and it’s what I did for my lamp. One you’ve decided on an approach and have all of your lamp components laid out, move on to the next step. Here’s my lamp after I cut the power cord (visible in the top left) and got everything disconnected. Before I got to drilling holes in the helmet, I went through and pulled off any parts that (a) looked ugly or (b) I could use elsewhere. 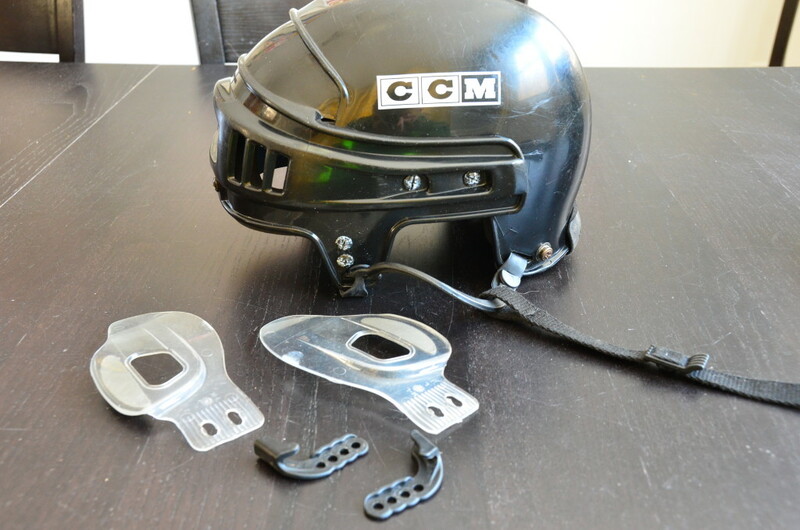 Things like chin straps, j-channels, ear pieces, cages, and screws don’t really add to the aesthetics of your lamp and can be used in your helmet repair kit (because you have one of those in your kid’s bag, right?). I also gave the helmet a quick wipe with a wet cloth and some Goo-Gone to get rid of some old sticker residue. 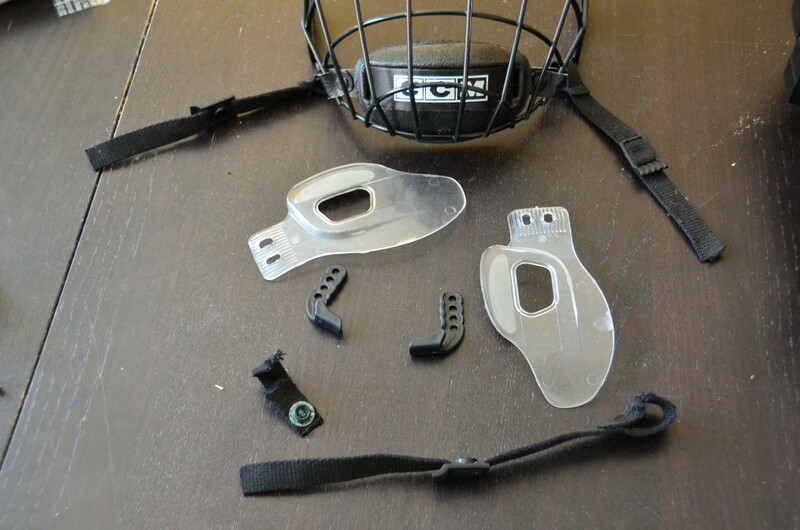 These are the parts I removed from the helmet. Some I kept, some I tossed. My helmet, mostly disassembled and cleaned. To complete this step, it was as simple as taking a knife and cutting out a section of padding on the inside of the helmet, and then drilling a hole in the top that would accept the lamp rod. 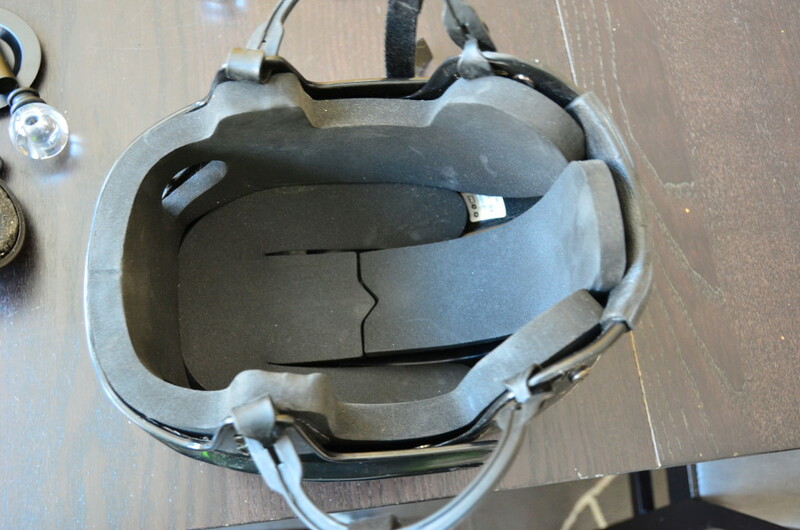 Here’s the inside of the helmet before I cut away the padding. And here’s the helmet with the center piece of the padding cut away. Line up your drill bit (make sure it’s large enough so it’ll accept the lamp rod/components) and go to town. This is where you get to re-assemble your ‘macaroni necklace’ by putting your lamp components back onto the cord. 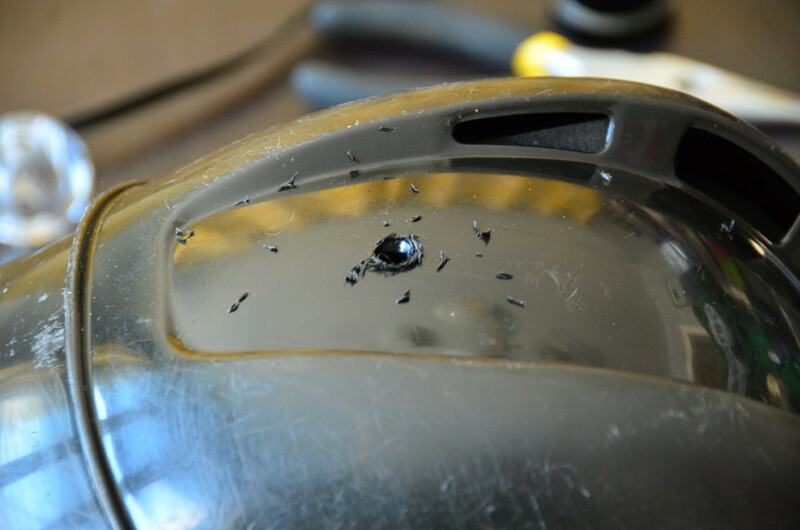 With the lamp reassembled through the hole in the helmet, you can see the original lamp components from the inside of the helmet. When I was putting mine back together, I did this step a few times to eventually get the look I was going for. Because the lamp I started with was so small (see ‘things I’d do differently’ below), if I put too many pieces of my lamp on the top of the helmet, then the base couldn’t reach the table to hold the lamp up (and I wanted the lamp base to be on the table versus having the helmet, which isn’t all that stable, to serve as the base). So the way my helmet lamp ended up was that just the light socket and a couple washers are on the top of the helmet, while the rest of my original lamp (and the base piece) are inside the helmet. This way the helmet sits on the actual lamp base and is very stable. You can see what I mean about using the lamp base to hold the entire unit upright. And here’s my end result! 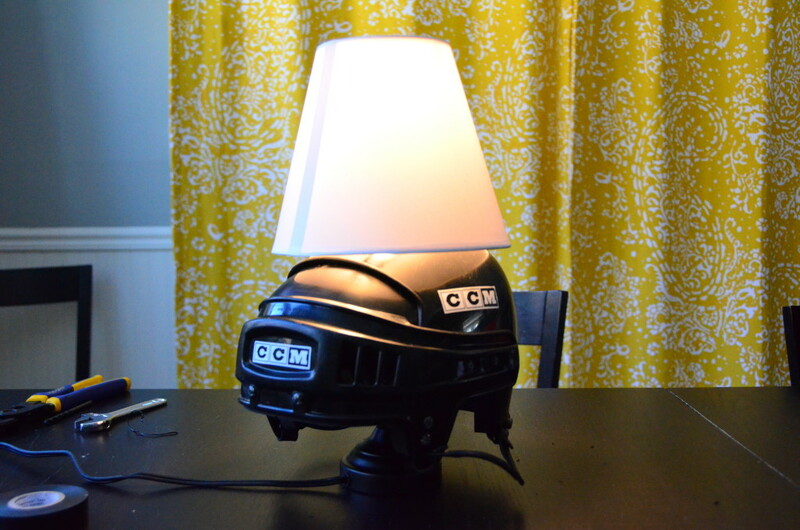 I am planning on grabbing a couple helmet stickers from my son’s travel team to complete the custom look, and the lamp will live on his homework desk. Like any rushed DIY project, I had some “Aw, man!” moments when I was done. Learn from me. 1 – I wish I’d gotten a taller lamp. With the shade attached, the entire lamp looks too compressed and the helmet doesn’t really pop. Plus there was the aforementioned issue with the base not reaching the table when I first put it back together. A taller lamp, perhaps with more components, would give you more reassembly options. 2 – I wish I’d purchased a lamp that either had screw connections where the wire meets the socket, or had the foresight to purchase a replaceable plug. As it was, I rushed myself and now my cord has a bunch of electrical tape holding it together. 3 – I wish I’d gotten some cool helmet stickers before taking the photos so you could envision how awesome a gift this could be for a little hockey player. My lamp is pretty generic in the photos, but it really pops when you add your kids’ favorite team stickers to it. Have any questions? Did you build one yourself? Share it in the comments and please share this post to Facebook and Pinterest!